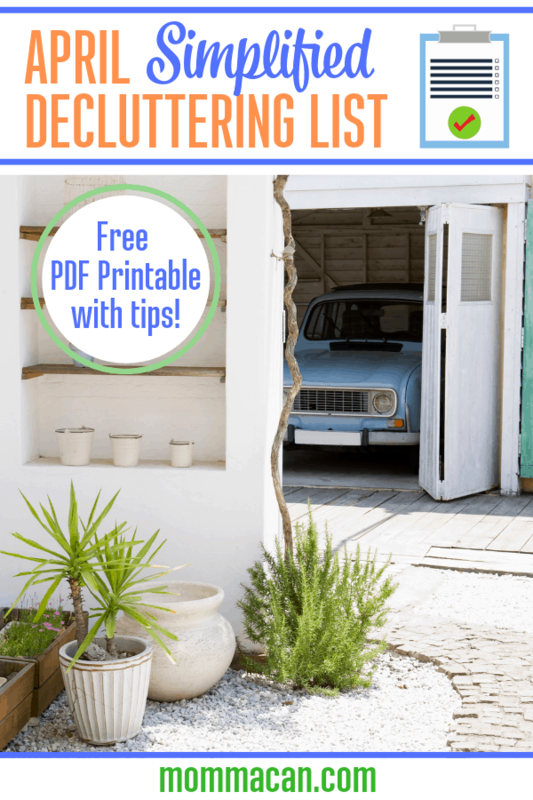 Today I have a Free Printable April Decluttering List! April is the perfect month to declutter! We are going to make the garage a place of joy and less of a stress mess! Join us! April is a month of new beginnings! I feel it is the best month to create spaces that renew not just our own personal spaces but the spaces that greatly impact our families. Our April Decluttering list is going to cover one of the largest spaces in the home. The garage. I know, don’t groan. I am sure it will seem like a tall order to many, but we have the whole month! Hooray! And its Spring! Spring is the time for a change! Clutter can really drag your spirit when it gets to be too much. What to declutter during Spring? Spring is the perfect time to declutter gardening supplies , sports, and recreation equipment, and countless other items we stuff into a garage. 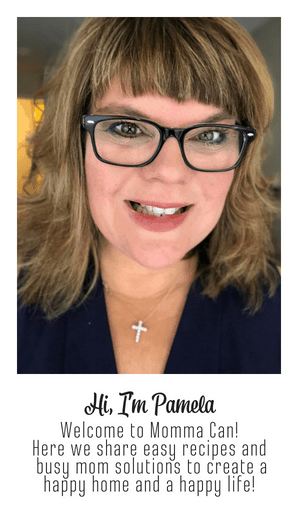 Decluttering in Spring means better weather! Yes, it can rain on many of the days. (Total bummer but needed to grow flowers!) However, lots of days are sunny and mild! So you don’t freeze your toes off and you don’t sweat all day! It’s the perfect weather for semi-outdoor decluttering! 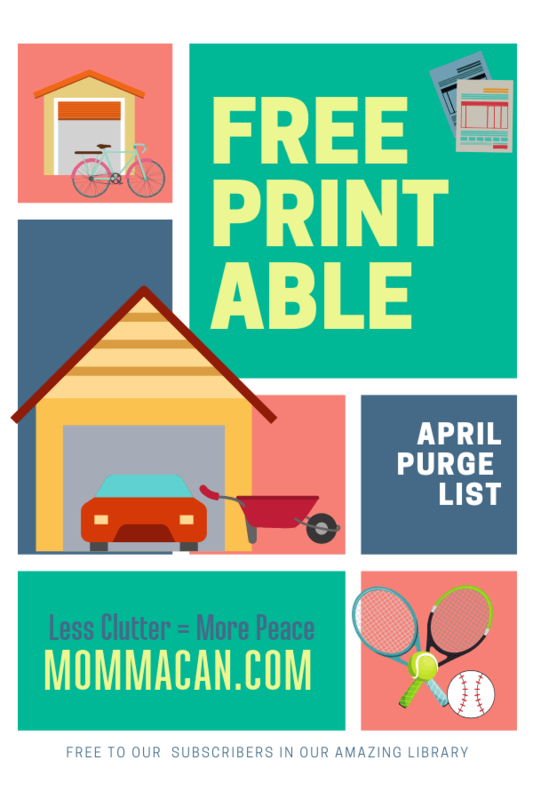 Our April decluttering list covers the garage because it is the first area many of us see after work and school! Do you close the garage door as quickly as possible so the neighbors don’t see your clutter? Can you open the car doors without bumping into items? Are the contents of your college dorm in the garage? Are you afraid to poke around because you have no idea what is lurking behind the junk? And the most important question of all! When you drive up after a long day of work or parenting and open that garage door, does the room bring joy? I mean seriously, the garage is the first impression you and your family have of your home. EVERY SINGLE DAY! And that is why April is all about the garage. For the full printable PDF list for the Month of April grab it in our amazing Printable Library. Details at the end of the post. Di you miss the first three months? No problem you can find those post below! Woot! Don’t miss a thing and grab our free printables, free printable artwork, and more in our Amazing Library! Details BELOW! Bonus: Once a week you will get a newsletter with yummy recipes, home tips and more!